Baton Rouge, Louisiana – Tuesday, April 3, 2018 - Lamar Advertising Company (Nasdaq: “LAMR”) will release its first quarter ended March 31, 2018 earnings report before the market opens Wednesday, May 2, 2018. Lamar will host a conference call on Wednesday, May 2, 2018 at 8:00 a.m. (central time) to discuss the Company’s results and answer questions relating to company operations. 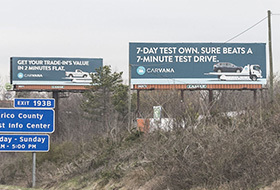 The Arizona-based online used auto retailer has placed dozens Lamar billboards along I-95, Interstate 64 and Interstate 195 in the Richmond area advertising its e-commerce car buying service.